How did I get started with the vSphere Python SDK “pyvmomi” on ubuntu distro? I usually enjoy working on vSphere Java SDK & PowerCLI but recently I thought to explore pyVmomi. What is “pyVmomi”? It is an open source Python SDK for the VMware vSphere API that allows you to manage ESXi and vCenter server. I was able to get started with pyvmomi on ubuntu distro successfully and I thought it is worth to share the steps I performed with you. 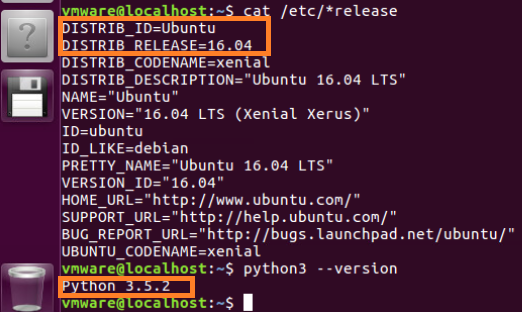 This guide is specific to setting up pyvmomi enviornment on ubuntu distro. Here we go. You can see, python version available is 3.5.2. Since we have python already available, next step is to install pip. What is pip? As per Wikipedia, pip is a package management system used to install and manage software packages written in Python. you could see, there was existing pip installation i.e. pip 8.1.1, which is uninstalled now and script installed latest pip-9.0.1. I think, it is better to have latest pip. Above step also confirms that our python environment is running fine. Now we are all set with all prerequisites i.e. ubuntu, python and pip. Lets now install pyvmomi and pyvim modules. Please take a look at below screenshot. As per above screenshot, pyVmomi, pyvim and all related modules got installed successfully. Now its time to write a sample vSphere API script : I leveraged one of samples available in community & simplified it for your easy understanding. Lets take a look at this sample script. Line 5,6,7: These lines are responsible for handling SSL certificate stuff, more on this in later posts. Line 8: It will get us a connection with vCenter or ESXi server. It will in fact get us the top level vSphere API object i.e. ServiceInstance. Please take a look at vSphere API reference. -You may have to deal with Python 2.7.x and 3.x syntax differences. -If you want to make pyVmomi work with python 2.x version, just replace “python3” with “python” for commands used to install pyvim and pyvmomi modules. Also “pip3” with “pip”. My environment works for both python versions. 4. Not interested in Python vSphere SDK? no problem, take a look at vSphere Java SDK and PowerCLI posts. I am enjoying exploring further on pyvmomi, let me know about your experience. Please stay tuned for more pyvmomi API sample posts.